The Brown Pelican Society of Louisiana was instrumental in getting a pro-morality billboard up in several locations in AIDS ravaged Tanzania. Tanzania is beset with sexually transmitted diseases and the typical liberal response has been to pass out condoms and try to encourage their use. Abstinence and respect for marital vows aren't even on the horizon for them. The Brown Pelican Society of Louisiana (BPSL) originally posted an open letter about this billboard to their web site. Sadly, that page has since been taken down. The link vanished shortly after a liberal web site posted an article entitled"Catholics proclaim being faithful kills" and linked to the BPSL page about that triumphant billboard. I do not know for certain WHY the article was deleted by the BPSL. Perhaps they were overrun by attack posts. I've submitted a question to the web site about this deletion but have not yet received a response. I'm writing about the article titled "Open Letter From Human Life International President, Rev. Thomas J. Euteneuer"
I notice that the article has since been deleted. Why was it removed from your web site? Fortunately I have a copy of the original content from before any comments were posted in response to the article. I'm posting it here so this small but important triumph won't be lost to the Internet "memory hole." I want to tell you about a most amazing project that HLI has initiated ... and then I need your immediate help so HLI can spread this truly life-saving program all over Africa! First, let me tell you about the project. Last week we got the attention of those who promote “King Condom” in Tanzania (East Africa) ... big time! 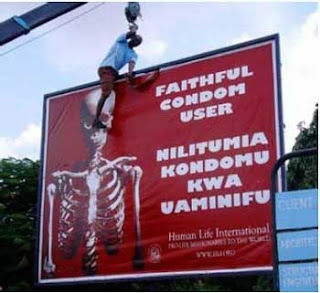 We did so when our HLI affiliate erected three billboards that featured a skeleton on a bright red background as the attention-grabber (image courtesy of American Life League) and used this title – written in Swahili so that the local population could read it – to drive home the truth about condom failure: “Faithful Condom User” [click here to see a picture of the billboard http://www.hli.org/hli_billboard_tanzania.pdf ]. One large billboard was placed near a main road in the capital city of Dar es Salaam while two smaller versions were put up elsewhere in the city. While we presumed that this message and graphic would be controversial, we didn’t expect the international condom lobby to go utterly ballistic over it! On Tuesday, the main newspaper in Tanzania, The Citizen, ran a story on our billboards. The article described people at “high-profile” anti-life organizations like United Nations Program on HIV/AIDS, Family Health International, Population Services International and others as “up in arms” ... and government officials as “jolted.” It said that the chairperson of the Tanzania Commission for AIDS was “furious” at HLI’s billboards and told of meetings that were held with members of the Prime Minister’s office to discuss an “urgent intervention” to suppress and censor our message! When the power structure of an entire country is rallied against us, that’s a sure sign that we’re right! Our billboards are telling the people the TRUTH about condoms ... and the heralds of the culture of death can’t stand it! The cost to do so is prohibitive ... $6,000 per country (that’s how much we sent Emil Hagamu, our man in Tanzania, to erect the three billboards) ... times 55 countries ... equals $330,000! That money will enable HLI to erect three billboards in each country. Although I’d dearly love to raise all $330,000 today, I’m not counting on that. So my short-term goal is to raise $24,000 so we can put up billboards in Kenya and Cameroon (the next two countries on our list) ... and get billboards in the works for two more countries. Our affiliates are already working on the logistics. I’m also frantically working to recruit 25,000 PRAYER WARRIORS who will help get the ball rolling by hitting their knees and praying for the success of this project. 1. Send HLI the largest donation you can out of the generosity of your heart! 2. Pray the Prayer to St. Michael the Archangel for the protection of our HLI affiliate in Tanzania from any retaliation ... one of the billboards has been vandalized and legal action has been threatened ... including jail time! Both your money and your prayers are needed NOW ... and both are deeply appreciated! Spreading HLI’s counter-cultural message of abstinence and fidelity will literally de-fang the AIDS monster, de-throne “King Condom”, and give the people of Africa a fighting chance to take back their society and their pro-life culture from the powerful international anti-life lobby that seeks to impose its failed method of stopping the spread of AIDS. Just click here https://www.hli.org/sl_appeal.php and follow the instructions to send your contribution. Please do it NOW ... time is of the essence. And PRAY. I’ll keep you posted on how this fight is going both in Tanzania and other areas of Africa. Thank you for your immediate help! God bless you.